Real hunters always like back to basic weapons during their hunting, and longbow is one of the most popular hunting bows in this category. There are many bows available nowadays, like a cross or compound bow, recurve bow, etc. Amongst others longbow is one which will give you 100% accurate shooting while hunting big animals like deer, elk, and even bear. If you like to hunt serious animals, Hungarian Recurve Bow-Handmade Longbow Flagella Recurve Horsebow is a fantastic option for you. The Hungarian recurve bow is not suitable only for hunting, it also an excellent bow for practice too which can turn you into a skillful archer that you can shoot like a champion with no time. Longbowmaker Hungarian horsebow is 100% handcrafted classical masterpiece, which deliver you such a unique quality which you will never find in a machine made bows. In our Hungarian recurve bow review we will focus on some more features where you will get an overview of it before making your buying decision. If you are ready to buy it now then you can check the latest price. The most exciting features of Hungarian Longbow is its wide range of draw weights starting from 20-pound all the way up to 110-pound. This range of poundage made it a multifunctional bow with a significant number of responsibilities. The combination of quality and convenience makes it operational in both hunting and practice shooting. You can choose 30-pound draw weight if you are a beginner and or use it for practice only. However, if you want to achieve a better result in hunting, minimum 40-pound is advisable. As this is not a takedown, it is not possible to change the weight after purchase. So, you have to decide first which draw weight is suitable for you. You can choose multiple bows too, as the price is not so much high, under $200. One of the high plus points of this longbow is that you could reach your aims without spending all your effort for shooting. It is an excellent tool for folks with injuries in the shoulder or weak health status. The best part of this handmade recurve bow is the riser and limbs made from durable materials which provide smooth and accurate pull. The riser is made of Cassia Siameaand Makore Wood and covered with cow leather. The limbs constructed with glass steel and beech woods which makes it flexible and unbreakable. The riser, limbs, and string all are made carefully from durable materials which permits you to use the device many times with comfort. It comes with completely knock down condition which saves your time to disassemble for storage. The arrows of this Hungarian recurve bow are handmade too which is preferable to any professional hunters. The arrows made from quality wood that is nocked and fletched with 3 pcs turkey feather. It comes with a length of 30’’ – 33’’ and pre-cut, hand-spine ready to shoot condition. Accuracy is must for any bow and Flagella Recurve Horsebow is not an exception of that. This Longbow is a bit taller than other bows which make it more forgiving in nature and allow the archer to shot with effortlessly and accurately. The performance of a longbow depends on its accuracy, so better accuracy means good quality guaranteed. Along with wide poundage, it comes with a good body length 145cm and string length 131cm which are perfect for beginner and seasoned archer. It comes with a safe draw length of 33’’ and a draw length of 28’’ which provides you high accuracy on target at a flashy speed and with fewer vibration or hand shock. For safety protection, it is necessary to wear an armguard during shooting practice as the string run almost touches your arm. It especially recommended for newbies. For extra safety, you can also wear a chestguard and finger tab to avoid pain. The package of Longbowmaker Hungarian recurve bow includes one longbow, three pcs of arrows, one armguard, one finger tab, a user manual, one target and one piece of the bowstring. Q. What type of string currently use by longbowmaker? Is it compatible with fast flight Flemish twist string? Ans. : The longbowmaker use nylon string in Hungarian horse bow. However, you can also use fast flight Flemish in it. Q. Is this bow only for target practice or it is usable for hunting too? Ans. : The Hungarian recurve bow comes with a wide range of bow weight. Depends on it is perfectly suitable for hunting too. Q. What type of arrow is perfect for this bow? Ans. : Feather fletching arrows are suitable for Hungarian bow. 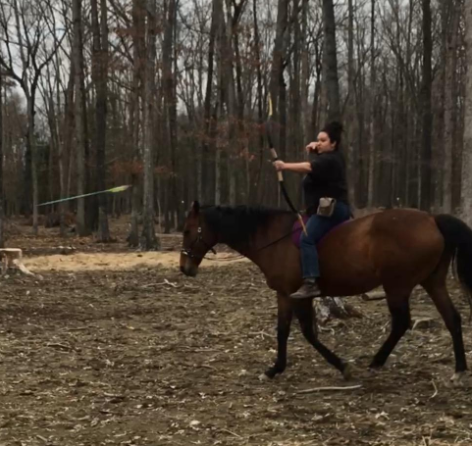 Mongolian Recurve Horsebow is also an excellent longbow brought to you by Longbowmaker. The riser and limbs made of wood, pigskin, cow leather, glass steel, and beech. The body length 137cm is a bit shorter than Hungarian, but the string length 132cm, draw length 28,’’ and safety draw length 33’’ are same. Altogether Pigskin Handmade is also an accurate, comfortable and beautiful longbow. If you want a longer or taller longbow, then you can choose SAS Pioneer Traditional Wood longbow. It comes with 68’’ body length which makes it more stable and gives a great shape. The riser made of Makore Wood, and Cassia Siamea and Limbs made of durable fiberglass with maple lamination. However, it is suitable for right-handed archer only. Longbowmaker is one of the largest handmade longbow manufacturers in China. They get regular reorder from customers around the world almost zero negative feedback. The Hungarian Recurve Bow Handmade Longbow Flagella Recurve Horsebow Archery 20-110LBS H1 is brought to you by that renowned Longbowmaker archery. Purely hand-made longbow is their specialty. They test all their products before shipment to ensure best bow reached in the customer’s hand. So, the Hungarian Horse Bow is a reliable, fast, convenient and fantastic longbow that you can choose for your hunting or target shooting.